At West Coast Solar, we focus on solar panels a lot because they are the primary component in collecting sunlight so it can be converted into usable, clean energy. A secondary component, the power inverter, converts the sunlight the panels collect into usable energy around your house for appliances, electronics, and more. When it comes to solar system design, you want to make sure you have the best power inverter for your solar photovoltaic system. In this post, we’re going to share three types of solar power inverters on the market today, and the pros and cons of each to ensure you choose the best one for your Sacramento home. We’ll then discuss how to choose the right inverter for your system. How Does An Inverter Work With A Home Solar System? As mentioned above, an inverter converts energy into a different form of power. For example, a PV solar system collects sunlight, creating direct current (DC). The inverter then converts the DC into alternating current (AC). Your home uses primarily AC to power your appliances, electronics, lights, and more. An inverter in a solar system simply converts energy from one form to another so it can be used in the home safely and efficiently. When looking at the entire system, the inverter is the second most important component, seeing that it converts the collected sunlight into usable electricity. Without an inverter, you would simply be producing DC power that could not be used in your home. Inverters do one thing: convert direct current into alternating current. Depending on your energy use needs and the system you will be purchasing, the type of inverter you’re going to buy can affect how your system operates. Below are the two types of inverters you may shop for when you decide to make the switch to solar power. This type of inverter is also known as a “string” inverter because all the solar panels’ electrical wiring is tied into strings and fed into a single inverter. In most systems, the inverter is mounted on the side of the home near the electrical panel, but we’ve installed inverters in garages, shops, and even basements. It all depends on your needs and what youre home will allow. The Cons: A centralized inverter can cause a bottleneck on your energy production. The inverter will only convert energy at the rate of your lowest producing panel, which means if a single panel is in the shade, the other panels won’t make up the difference. The Pros: The “string” inverter is the least expensive and the most reliable. It’s technology is considered tested and approved across the industry. Similar to centralized inverters, the microinverter converts DC energy into AC energy. However, the microinverter is not centralized. Each panel gets its own inverter, which then converts the energy produced from that panel into AC energy. Then it gets sent to the electrical panel. Microinverters are highly efficient and remove the “bottleneck” effect of a centralized inverter. The Cons: Microinverters cost more since they’re more efficient, and you will need to purchase multiple of them to pair them one-to-one with your solar panels. They are also more difficult to maintain since they’ll be on your roof and not on the side of your house or in your basement. The Pros: Efficiency and monitoring make microinverters a great feature for solar systems. With microinverters, you can monitor the energy production of each individual panel. If one panel is out, the rest of the system continues to produce energy. 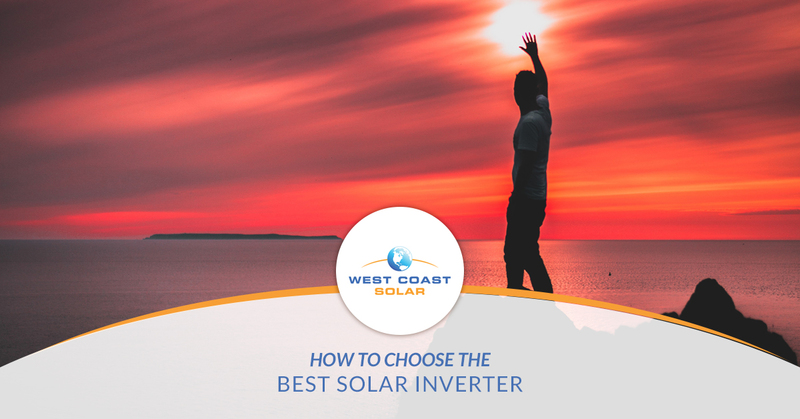 Two factors play directly into how you choose which inverter is best for your solar system. The first is the cost of each type of inverter. How much are you willing to spend for increased performance? If you spend more, you’ll most likely be getting a much better return on your energy production. The second factor is technology. Which technology is going to be the best for your solar power system? You can attempt to answer this question on your own supplemented with research from the internet, or you can find a solar installation company in Sacramento like West Coast Solar. West Coast Solar has been serving Sacramento and its adjacent counties for more than a decade. We stay on top of the advancing technology so you get the best solar energy system for your home. Our mission is to keep solar simple. Ready to get started? Give us a call today!